Hiya guys. I told myself I wouldn't stay up late but yet here I am typing this post up for you guys at almost 5 am. I'm totally going to regret this, haha. I need a t-shirt that says "I make bad sleeping choices" or something to that extent. I think I'm going to end up getting two-three hours of sleep and force myself to get up otherwise work on Weds won't be fun. But you know what's always fun? Stamping! Especially if you're super lucky and have a crap ton of new plates to use. All I need now is some stamping polishes, but that's another story for another day. 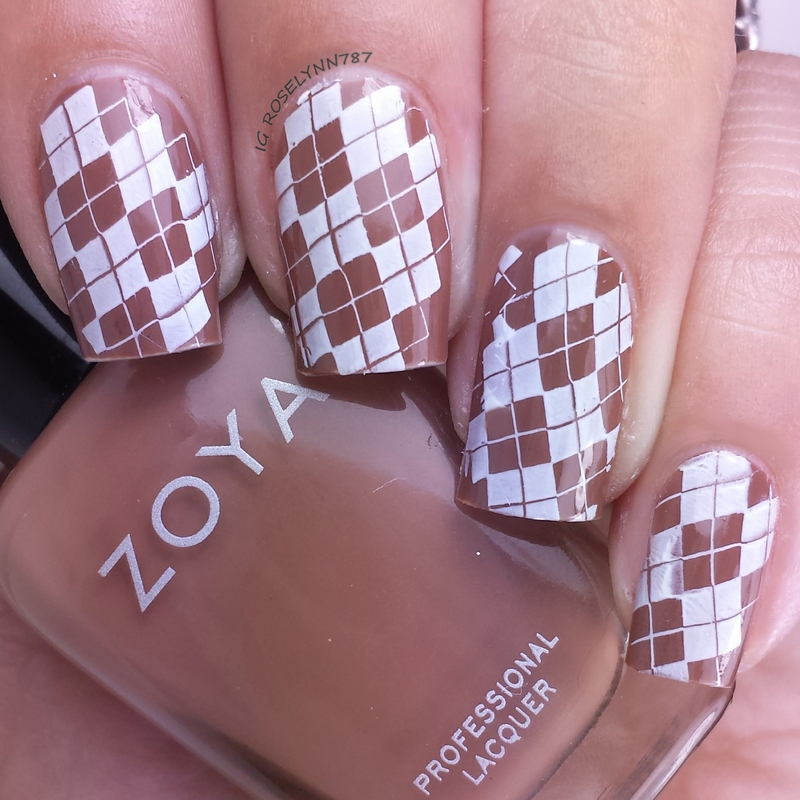 Today I have a cute stamping design using a brand new plate and some Zoya polishes. Not perfect but definitely not bad either. I love this image plate and I can't believe how long it took me to use it. I started off pretty good but I messed up the stamping process just a tiny bit on my ring finger. For all the usual reasons... rushing. One of these days I'll learn to take my own advice and work slowly and steadily. Anyway, like I said, I love this image plate. As I was writing this up I actually remembered where I got it from. I received it with a pre-order I made with Cult Nails a few months ago but I do believe she sells the plate individually as well. I love the color combination for these two polishes, it reminds me of ice coffee with whip cream on top. I'm actually getting quite hungry as I'm writing this haha so don't mind me. Polishes used are Purity and Chanelle (you can see the review and solo swatch for Chanelle in the previous post). I sealed this design with a fast drying topcoat after I was done. I hope you guys like this as much as I do! I'm off to celebrate the day with my mom because it's her birthday. I cannot wait to hear from you all. Take care, later guys.